Over the course of the last month since Juan Guaidó declared himself the president of Venezuela on January 23, the news has been inundated with many often-conflicting headlines about the current political and economic reality in Venezuela. Was there a coup? Is there a humanitarian crisis? What does it mean to protect democracy in the United States’ “backyard”? 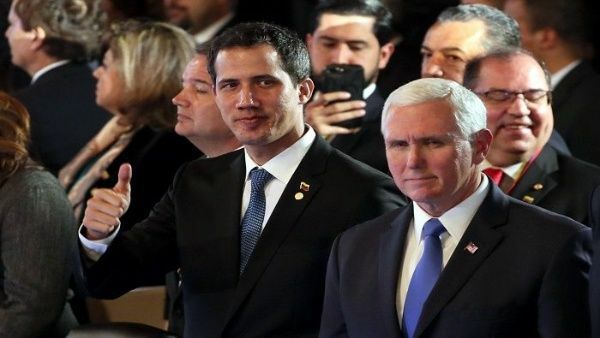 Guaidó’s assertion that he is now Venezuela’s rightful president followed a phone conversation with U.S. vice-president Mike Pence the evening before, during which Pence assured Guaidó that he would receive the backing of the United States if he declared himself president. Guaidó alleges that the elections in May leading to president Nicolás Maduro’s re-election were illegitimate, and that he should instead be recognized as the country’s leader. It is worth noting, however, that Guaidó did not run in the presidential elections (nor is he proposing an electoral process now), that 81 percent of Venezuelans had never heard of Guaidó before last month’s events, and that Venezuela’s right wing, including Guaidó’s Popular Will Party, boycotted the elections despite Maduro’s open invitation for international electoral observers to oversee the election process. Following what many have designated an attempted coup, the Trump administration has urged the “international community” to support Guaidó despite the lack of popular support, the clear breach in the country’s democratic process, and massive rallies across the country denouncing Guaidó and foreign intervention. The intervention—hiding behind a pretext of humanitarianism—follows a long pattern of U.S. economic policies and covert operations in Venezuela and in the region that seek to protect the economic interests of the United States and Europe. The long history of imperialism in the region, and the stronghold of the United States and Europe over the region’s resources, has been threatened by a push for economic independence asserted by left-wing leaders and popular movements. Venezuela—home to the world’s largest crude oil reserves—is no exception. 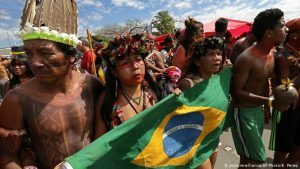 Much is at stake in the protection of Venezuela’s democratic process, which stands out as a stronghold against the current rightward trend in the region, from Brazil’s Jair Bolsonaro to Colombia’s Iván Duque. The threat of Venezuela is not just about oil, then. It is also about proposing an alternative world order that puts people before profit. This time around, the makers of Venezuela’s coup have sought legitimacy through a series of misleading narratives, banking on humanitarianism as a pretext without asking why, exactly, there is a humanitarian crisis to begin with. The United States uses food and medicine shortages, among other hardships, as justification for intervention, ignoring the progress made through Chávez’s and Maduro’s social programs—a stark contrast to the damage caused by policies crafted by U.S.-friendly administrations as well as the damage caused by direct U.S. intervention. It is absolutely true that life for average people in Venezuela is difficult. But what is conveniently left out of this narrative is what, exactly, is causing this hardship; that those who manufactured the crisis are the same as those attempting to carry out the coup. It leaves out the severe economic sanctions imposed by the United States to strangle the Venezuelan economy, a tactic that brings to mind Nixon’s directive in 1970 to Kissinger to “make the economy scream” in Chile. 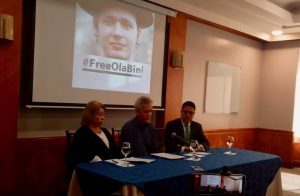 Similar to Chile, this hardship has been used by mainstream media, by the U.S. government, and by the Venezuelan right-wing opposition to make a case for a coup. Nixon’s directive was part of a larger plan to destabilize the socialist government of Chilean President Salvador Allende, which threatened to reclaim national resources, such as copper, that had long been held by transnational corporations, and instead use the country’s natural wealth for the good of the Chilean people. Similarly, since Chávez’s election in 1998, Venezuela’s oil industry has been used not only to fund social programs in Venezuela, but also across the world—profits that formerly went into the pockets of the national elite and transnational corporations. History has shown us what happened following the CIA’s economic destabilization campaign in Chile; the hardship created was used as a pretext to justify the military invasion in 1973 that led to President Allende’s death and the torture and disappearance of thousands of left-wing activists under the brutal regime of Augusto Pinochet. It was used not only to crush Chile’s socialist project for national sovereignty, but also as a laboratory for neoliberal policies that were then implemented throughout the region and throughout the world. The social cost of these policies and their leaders is horrific, with hundreds of thousands of civilians and activists tortured and disappeared by U.S.-backed regimes. This history is one that should make us wary of the United States’ vow to protect democracy and human rights in Venezuela, at the very least. If the U.S.-supported intervention in Venezuela is not about democracy, then what, exactly, is it about? If that is not enough to elucidate the United States’ intentions, in 2017 Mike Pompeo—who at the time was the CIA director under Trump—declared that “We are very hopeful that there can be a transition in Venezuela and… the CIA is doing its best to understand the dynamic there.” In 2013, Trump, who appointed both Bolton and Pompeo, tweeted: “I can’t believe we left Iraq without the oil.” Former FBI Deputy Director Andrew McCabe even quoted Trump in a private meeting in 2017 saying, “That’s the country we should be going to war with. 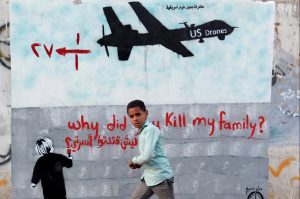 They have all that oil and they’re right at our back door.” It is not difficult, then, to draw the connection that— true to character—the intentions of the United States are not about humanitarianism and democracy after all. As Vijay Prashad of Tricontinental: Institute for Social Research points out, Venezuela has provided support to poor and working people in Cuba, Nicaragua, Haiti, and even the United States, among other countries. Not only does Venezuela hold the world’s largest oil reserves, but it has also played a leading role in a leftward shift in the region, using its resources to support social programs and progressive governments throughout the region and the world, even extending its support to the poor and dispossessed in the United States. In Haiti, recent uprisings have been triggered by the hardship confronting Venezuela. In the wake of Venezuela’s economic crisis, Haiti—once a beneficiary of the PetroCaribe scheme, in which Venezuela provided low-cost oil to the country as an alternative to predatory IMF schemes—is now faced with the IMF knocking at its door, demanding an end to subsidized oil and an opening of its economy to neoliberal restructuring. The success of Chávez and Maduro’s governments in reducing poverty and inequality in Venezuela and their ability to lend aid to working people around the world pose a direct threat to the United States’ agenda. During the 14 years of Chávez’s presidency, the country experienced an average of 3.2 percent economic growth, increasing to 4.1 percent after Chávez took control of the state oil company, PDVSA, in 2004. The profits from the oil sector have been used to bolster social programs in areas such as housing, health, and education. Programs such as the Comité Local de Abastecimiento y Producción (CLAP) and Plan de Atención a la Vulnerabilidad Nutricional provide 50,000 tons of food per month to 6 million Venezuelan families (compared to the measly 60 tons that could be purchased with the $20 million of aid offered by the United States). According to Mark Weisbrot and Luis Sandoval of the Center for Economic and Policy Research and other sources, inequality has decreased substantially compared to the pre-Chávez era. It is true that Venezuela today is experiencing an economic crisis. But it is important to put the current reality in context with the pre-Chávez neoliberal era—which failed to provide basic services to the Venezuelan people even without the staunch opposition of the United States and its allies—and in the context of crushing economic sanctions and an economic war that has systematically denied the country access to credit and repeatedly staged a series of economic and political interventions. Today, the U.S.-imposed sanctions alone cost Venezuela an estimated US$30 million per day. Under pressure from the U.S., the Bank of England has denied Venezuela access to $1.2 billion of gold stored there—money that could be used to provide medicine and aid to the Venezuelan people. While painting a picture of Maduro as a heartless dictator who refuses to provide aid to his people, the U.S. is simultaneously lobbying the Bank of England to deny Maduro access to crucial funds and instead turn Venezuela’s gold over to Guaidó. Meanwhile, the United States has stationed military planes on the Colombian border carrying US$20 million worth of so-called humanitarian aid. Maduro, recognizing the history of humanitarianism as a trojan horse for intervention and the political motives behind the U.S.’s offer, has denied the aid. Even the United Nations and the Red Cross have refused to support the U.S. aid shipment, which they accuse of being politically motivated. In other words, if one is to take a step back and look at the bigger picture of the crisis in Venezuela, the missteps of Maduro’s administration pale in comparison to the impact of U.S. economic warfare. In Amin’s view, if the 85 percent of the world’s population that currently lives in the Global South were to “de-link” from imperialism and link to each other, it might be possible to build an alternative global order that does not surrender itself to the conditions of the United States and its allies. In other words, if Venezuela can defeat yet another attempted U.S. intervention, as it has repeatedly done since Chávez’s election in 1999, and if it can successfully withdraw from the terms set by the United States, its allies, and its institutions—such as the IMF and its banks—and support a people’s agenda in places as far away as the United States, Cuba, and Haiti, those countries might have a chance at national sovereignty and at crafting an agenda that uses wealth for a people-centered agenda, rather than deepening the bottomless pockets of the elite. Celina della Croce is a coordinator at Tricontinental: Institute for Social Research as well as an organizer, activist, and advocate for social justice. Prior to joining Tricontinental Institute, she worked in the labor movement with the Service Employees Union and the Fight for 15, organizing for economic, racial and immigrant justice. This article was produced by Globetrotter, a project of the Independent Media Institute. An earlier version of this article first appeared in Shoestring, a local magazine in Northampton, Massachusetts. Hey Buddy!, I found this information for you: "Who is the real culprit behind Venezuela’s political turmoil?". Here is the website link: https://peoplesdispatch.org/2019/03/01/who-is-the-real-culprit-behind-venezuelas-political-turmoil/. Thank you.